(Natural News) A 10-year study found that the rise of illegal hunting in Kenya have forced elephants to become nocturnal, according to a Daily Mail report. “The escalation of poaching has become the greatest immediate threat to the survival of elephants,” Festus Ihwagi, study co-author and a researcher at the University of Twente in The Netherlands expressed. Elephants in the eastern part of Africa have changed their habits and learned to travel at night and hide during the day to avoid illegal hunters. “As most poaching occurs during the daytime, their transition to nocturnal behavior appears to be a direct result of prevailing poaching levels,” Ihwagi explained. Ihwagi monitored the movements of 28 females and 32 males in and around Kenya’s Laikipa and Samburu reserves together with Save the Elephants (STE), a non-governmental organization. 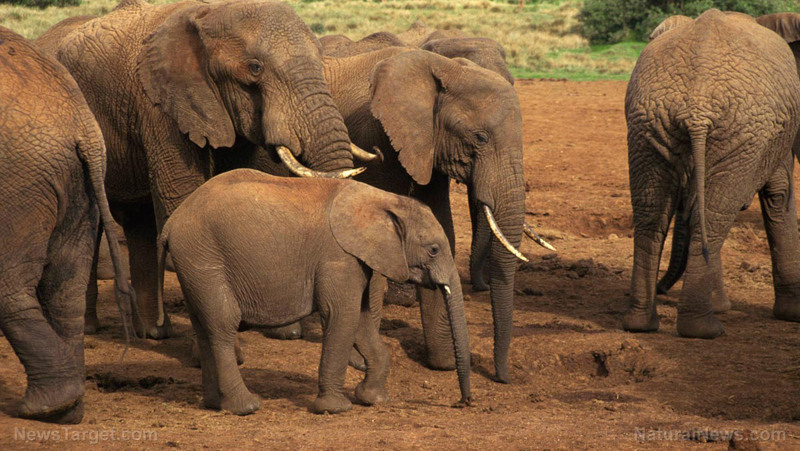 Female elephants live in close-knit families called a herd and often have young calves at their side. The herd is led by a matriarch, the oldest and often largest female in the herd. On the other hand, the males tend to be more solitary or live temporarily with other males. Ihwagi compared two sets of data to determine how and to what extent poaching had changed elephant behavior. The first data measured the distances traveled during the day and at night, and was logged as a ratio between the two. The second data identified zones and time periods when poaching was more or less severe. This was drawn from the Illegal Killing of Elephant program database. The findings showed that simultaneous elephant tracking and monitoring of causes of death presented a “natural laboratory,” according to Ihwagi. There was a significant increase in the movements of elephants at night, especially for females, in sync with poaching levels. The “largest land mammals” were tracked using global positioning system (GPS) devices for up to ten years during the period 2002 to 2012. He told Agence France-Presse (AFP), as cited in the Daily Mail article, that females reduced daytime activity by about 50 percent on average in high-danger zones compared to low-danger zones. Elephants are intelligent animals, but despite of this, deeply-ingrained foraging strategies and mating patterns developed on an evolutionary timescale may limit their capacity to adapt. Ihwagi explained that for mothers with very young calves, the risk of predation of the calves by lions or hyenas would be higher at night. For mature elephants, it implies an alteration of their normal social life. The researchers said that the real-time data from GPS devices could be used as an early warning system to alert environmentalists and park rangers, like a sudden increase in nocturnal travel could signal that elephants feel threatened. This is not the first report about elephants going nocturnal. In a 2010 article by Futurity.org, a study revealed that the sound of nearby human activities, such as chainsaws, gunshots, trucks, and workers, prompted the elephants to change their behavior to a nighttime routine. The International Union for Conservation of Nature (IUCN) estimated the population of elephants by around 111,000 to 415,000. One of the major threats in the lives of elephants is poaching. The surge in poaching, which began a decade ago, had been the main driver of the decline, according to the IUCN. Elephants are being poached for ivory trading which is driven by demand for ivory in countries where it is sought after as a status symbol and an investment. A research by the STE revealed that an estimated 100,000 elephants were killed for their ivory in Africa between 2010 and 2012. Read more news like this at PetHealth.news.